High-security laboratories that handle the most dangerous viruses and bacteria have reported more than 100 accidents or near-misses to safety regulators in the past five years, official reports reveal.One blunder led to live anthrax being sent from a government facility to unsuspecting labs across the UK, a mistake that exposed other scientists to the disease. Another caused the failure of an air handling system that helped contain foot and mouth disease at a large animal lab. Security issues alone should prevent the research centre being built. The centre would be a prime terrorist target because (1) there are three iconic sites in the closest proximity – the Eurostar terminal, the British Library and the Medical Research Centre itself; (2) the nature of the work to be undertaken at the Centre – the public information released to date suggests that it will be handling dangerous material and (3), all three of the major British political parties have given it enthusiastic public support which both raises its public profile and attaches it to national politics -hit the centre = hit the politicians – (see document 23). Whether as a result of a terrorist attack or a failure of bio-security the consequences of an escape of dangerous biological agents would be severe, both in terms of any contamination of people and by the economic effects on London (and by extension the country) which the fear generated by the escape of toxins would bring. I have been attempting without success to get answers about the security arrangements for the proposed research centre since 2007. (For my dealings with the consortium and its individual members on security and other matters see documents 10-22). My requests have been turned down on the grounds that this would breach security. This is a bogus ground for refusal because I deliberately did not ask for detailed operational accounts of their security, which would compromise security, but general issues such as whether the security staff will be employed directly by the centre; whether the staff will have been raised in Britain (vetting foreigners is in practice impossible); how cleaners (normally a weak point in security because they work at night when security is minimal); how toxic materials will be transported in and out of the centre and whether the security staff would be armed, something absolutely necessary if there is a threat of terrorist attacks especially if they involved suicide bombers. The real reason why the consortium will not comment is they do not have a clue about how their security will work. The UKCMRI CEO John Cooper gave the game away at a meeting convened by St Pancras and Somers Town Planning Action and held on 4 10 2010 in the Somers Town Community Centre when he said that their security arrangements would not be decided for three years. It is absurd to allow people who have not considered in detail the security issues involved before submitting a planning application to be granted that application, not least because the design and situation of the building should be taking these issues into account as one of the primary drivers of the design. This raises two security problems: the vetting of such people and the lack of a single authority responsible for the security of the centre. This is precisely what happened at Pirbright which was split between government and private business with no one in overall control (see document 9). Come the foot and mouth outbreak of 2007 no one would take responsibility with both sides blaming the other. Thorough vetting of those who come from abroad would be impracticable and vetting of anyone born and raised in Britain but who has spent substantial periods of time abroad problematic. These considerations would be relevant to both scientists and other staff, many of whom would be foreign or have spent long periods out of the country. I would also draw the planning committee’s attention to the fact that Islamic extremism is seen by the government as a growing problem in British universities (see document 5) and that one of the consortium’s members – UCL – has been recently had a student- Umar Farouk Abdulmutallab – who went on to try to commit a terrorist act (see document 6). The limited access proposed for the public would also be a weak link in the security. Things are no more promising on the bio-security side. At the meeting of 4 10m 2010, John Cooper promised that nothing more dangerous than influenza viruses would be in the centre. However, this was meaningless because, as he very grudgingly admitted, there would be legal bar to this policy being changed at some point in the future. Moreover, ‘flu viruses can be extremely toxic, vide the 1918 epidemic which swept Europe and caused more deaths than had occurred in military action during the Great War. If the level 4 work is not to come to the proposed research centre the consortium’s claim that their work has to be done at the Brill Place siteis discredited. If it does come to the site then risk is raised considerably. As to whether it will come to the site, answers given by John Davidson at a meeting held 11 10 2010 in the Ossulton TRA Hall provide a strong pointer. Questioned by myself, he stated that the Mill Hill facility would definitely be closed if and when the centre was built and he could not rule out all the Mill Hill work being moved to the Brill Place site including the level 4 risk work. Man dies in government cancer drug trial A man about to get married has died in a government-funded medical trial after receiving seven overdoses of drugs. It is wildly improbable that there will not be a breach of security, either through negligence or terrorist action, from the Francis Crick Institute (FCI), which will be dealing with some of the most dangerous viruses. Situated where the FCI is, any escape of pathogens would be unambiguously disastrous. It is next door to Eurostar Terminal and St Pancras Station, a few hundred yards from Kings Cross and Euston stations, a few yards from the British Museum and only the width of a street from residential housing on its Western boundary. Huge numbers of commuters and visitors to London pass through the area every day. It would be difficult to think of another part of London which would cause as much disruption in the event of the escape of dangerous viruses. Permitting the building of the FCI on such a site is an act of criminal negligence by the planning authorities. The United Kingdom Centre for Medical Research and Innovation (UKCMRI) was granted planning permission for a research laboratory on 16 December 2007 . This is a consortium comprised of the Medical Research Council (a taxpayers funded body) , Cancer Research UK, the Wellcome Trust and University College London which is part of London University. The Laboratory is now named the Francis Crick Institute and building is underway on a site directly behind the British Library in central London. The UK Centre for Medical Research and Innovation (UKCMRI), a world-class biomedical research institute planned for central London, is to be re-named The Francis Crick Institute in honour of one of the nation’s greatest scientists. Construction work on the institute will formally start in early July and the change of name will coincide with this milestone. Professor Crick, who lived from 1916 to 2004, is best known for the discovery of the double helix structure of DNA in 1953, alongside James Watson and collaborator Maurice Wilkins. The trio were jointly awarded the Nobel Prize for their work on “the molecular structure of nucleic acids and its significance for information transfer in living material”. His name will be adopted as the permanent name of the UKCMRI, reflecting the centre’s vision to create a world-leading facility for medical science and innovation in London’s St Pancras. The institute will initially build on the skills and research institutes of the MRC National Institute for Medical Research (NIMR) and Cancer Research UK’s London Research Institute (LRI). University College London and the Wellcome Trust are founding partners and King’s College London and Imperial College London have signalled their intention to join the partnership. As well as driving the development of treatments and methods for the prevention of cancer, the Francis Crick Institute will also have research programmes on circulatory conditions, infectious diseases, immune system disorders, and neurodegeneration and regeneration. Is Britain’s big biomedical institute in the right place? The project has been billed as the most exciting biomedical research initiative for a generation. Now plans to build the giant research centre in London have been given qualified backing by members of parliament. The Science and Technology Committee publishes its report on the UK Centre for Medical Research and Innovation (UKCMRI) which commends the scientific vision for the centre but expresses reservations about the project’s location. The case for the centre’s central London site near St Pancras station was far from overwhelming and it could have been built elsewhere, says the committee. The advantages of a central location for up to 1500 staff come at a price: the cost of construction is higher at St Pancras than any viable alternative site; a site incapable of expansion; and the concentration of medical sciences in the south of England. The “initial investment” for the project has risen to an estimated £645 million but do not include the full cost of fitting out the UKCMRI. The operating costs are estimated to be around £100 million a year, though the evidence before the committee suggests that they could be significantly higher. I write in response to your “Is Britain’s big biomedical institute in the right place?” There is an issue relating to the siting of UKCRMI of which you will be unaware: Gordon Brown when Prime Minister interfered with what was meant to be a bidding process so as to invalidate the process. He did this by actively promoting the sale of the land to UKCRMI even before the closing date for expressions of interest. The sale of the land was supposedly to be decided by the DCMS Secretary of State, yet Brown was instructing the various government departments involved to facilitate the sale to UKCRMI. How do I know this? Through the use of the FOIA. I have set up a blog http://www.ukcmri.wordpress.com/ which deals with Gordon Brown’s interference and the other objections to the site, especially the security of the institute and provides a good deal of background to the protests against the institute being placed on the site. You may cite or reproduce any of the material on the blog. Should you wish it, I will make available to you all the documents I have received using the FOIA, although the most important ones are on the blog. I should also be happy to write an article on the matter for you. Laing O’Rourke has secured the biggest publicly-funded building job to be bid in London this year. The project to build a new national nerve centre for biomedical research next to St Pancras International station is shrouded in secrecy. Firms have been reluctant to talk about bids because of strict confidentiality clauses. But the Enquirer understands that Laing O’Rourke has just won the main contract for the superlab after pitting its wits against rival teams from Mace/McAlpine, Bovis, Bam and Skanska. Laing O’Rourke secured the £40m concrete basement package of the UK Centre for Medical Research and Innovation several weeks ago. Since then it has been on tenterhooks to find out whether its main bid to run the entire four-year long job was also succesful. An insider told the Enquirer: “Everybody involved appears to have taken a vow of silence but Laing has won the entire job. 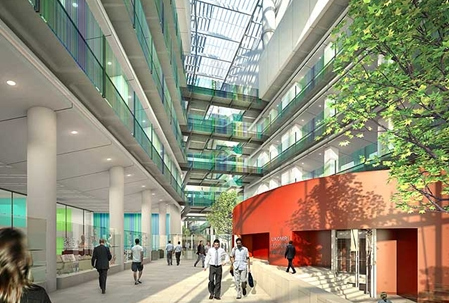 Plans to build the 80,000 sq m centre for biomedical research were unveiled by then prime minister Gordon Brown in a fanfare of publicity as one of the world’s largest centres of biomedical research. The UKCMRI is expected to attract the brightest and best scientific minds to the capital to work on cures for cancer, heart disease and degenerative conditions linked to ageing. Main construction on the building designed by architects HOK with PLP Architecture is expected to start in a May and take about two years to complete. A further two years will be spent fitting out the institute, installing equipment to run building services for advanced laboratories. The building’s vaulted roof is arranged into two shells and will be fitted with solar panels. A third of the building will be below ground to reduce its visible mass.